For some reason my Spell check has gone haywire recently. Today, I wrote; "It's a very good place to start. Review every six months." The image shows that it - erroneously - picks up 'It's', 'every' & 'months', which are all correct. I can't do a screenprint of its offers, as when I click the alt button, the menu goes off. eg; it wants every as "very s" & months as "month s" etc. Is something amiss with T.Bird that is known to you ? Otherwise, any idea what's occurred please ? Last edited by LIMPET235 on February 3rd, 2019, 7:08 am, edited 1 time in total. Is this with the EN-UK spellchecker? Update TB to 60.5 if your dictionary is v. 2.69. I haven't done anything around the time this started, no update, install etc. I didn't know there was an update to TB, it's set to auto update. I don't know which dictionary I have - i'll try to look. However, I still don't know why it started 'all of a sudden'. As you will see in my sig, I have updated to 60.5.0 (made another donation). I'll see how I get on with spell-check, but again - why did it go wrong in the first place. I can't duplicate your problem using the built-in en-us dictionary in Thunderbird 60.5.0. I also tried using the British English Dictionary (Marco Pinto) 2.69 dictionary. Firkin wrote: As you will see in my sig, I have updated to 60.5.0 (made another donation). 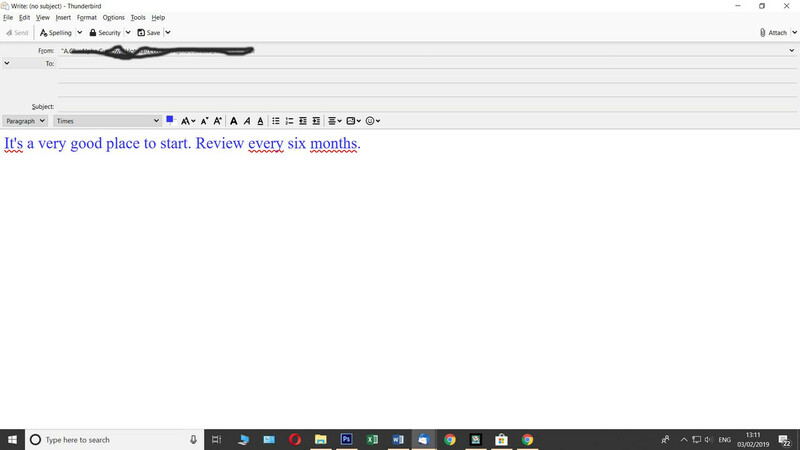 If it is the Marco-Pinto English GB spellchecker that you are using then as of version 2.69 of the speller the format of the addon changed from old style (whatever that was) to the (new) WebExtension format. Because of this change in format that spellchecker needs Thunderbird version 60.5+ to get the speller to work properly now. I would suspect that what has happened is that the speller you had installed updated itself in the background without you being aware that it had done so hence you get the surprise of errors where none were before. To find out what speller you are using go (menu) Tools > Add-ons then in the left-hand side of the listing that pops up click Dictionaries. If it is the Marco Pinto speller then click on the More option and you will be able to see the version number of the speller. I use the Marco Pinto speller myself and don't have the problem you described. However, I always keep Thunderbird and Firefox up to date so wouldn't experience the problem when Marco changed it to WebExtension format. I just did a test 'install' of Thunderbird v60.4.0 (portable) then installed the Marco Pinto speller v2.69 into that Thunderbird. Result of the test was that I was able to replicate the 'errors' you gave in your original post. So, yes, this would seem to confirm that Thunderbird updated your speller in the background and this led to the issues you indicated because the version of Thunderbird you were using was incompatible with the new speller WebExtension format.